One of my all-time favorite and memorable family backpacking adventures. Above: Click on the photo to enlarge. This is a photo of the peaks of the Ptarmigan Traverse, from the summit of Forbidden Peak. Visible in the foreground is Mixup Peak and two important saddles to the left: Cache Col and Gunsight Notch. Next behind is Spider Mountain on the left, then the Middle Cascade Glacier and Mount Formidable. Finally on the distant left is Dome Peak with Glacier Peak far behind. I have done so many hikes I can't remember nearly half of them, but one I will never forget is the Ptarmigan Traverse of the North Cascades. 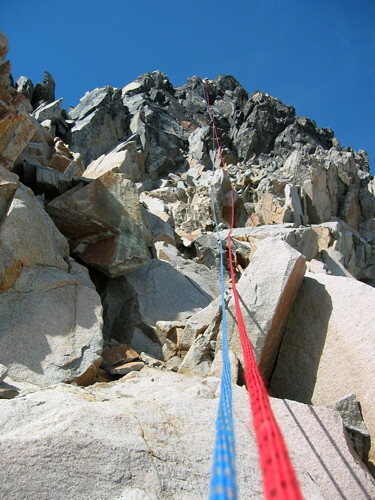 This is a high alpine traverse involving daily glacier travel through rugged North Cascades majesty. In 2003, my family (dad, mom, sister, and I) did this beautiful 6-day hike. This page shows some of my photos from our 2003 family adventure. I also provide links to more recent adventures on the Ptarmigan Traverse. 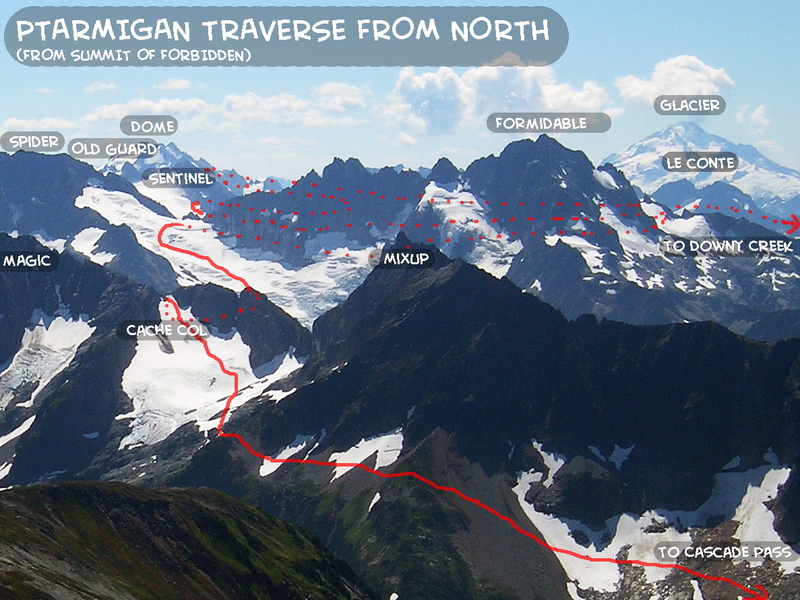 In 2009, I did the Ptarmigan Traverse from the South to the North. The 2009 trip report is much more detailed and has more photos. Go to 2009 trip report. Also, in August 2007, my mom and I did a 2-night backpack to just past Kool-Aid Lake on the Ptarmigan Traverse. The second day I climbed Mt. Formidable. DAY 1: My sister Jenny climbing up to Cache Col. DAY 1: Mountain goats at Kool-Aid Lake. DAY 1: Campsite at Kool-Aid Lake. DAY 2: Approaching Mid Cascade Glacier. DAY 2: Camp at Yang-Yang Lake. DAY 3: South Cascade Glacier. DAY 4: Sliding down a snowfield into White Rock Lake, on our rest day at White Rock Lakes. DAY 4: Looking at the next day’s traverse of Dana Glaicer, taken from White Rock Lakes. DAY 5: Pink monkey flower on hillside traverse. DAY 5: Traversing Dana Glacier. DAY 5: Nighttime view from tent on Itswoot Ridge. DAY 6: Tiger lily on trail. On Day 5 of the Ptarmigan Traverse, my dad, sister, and I climbed Spire Point via the East Face (4th to low 5th). Click the photo below to see a short trip report for our climb of Spire Point.